Calling the Jammu and Kashmir as the "soul" of India, Ms Mufti said young men and women in the state had been excelling in national-level examinations and in sports. 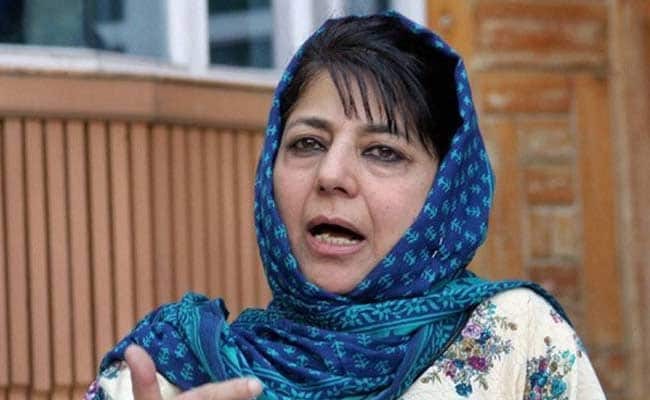 Srinagar: As school students clashed with security forces in Jammu and Kashmir's Pulwama district on Monday, Chief Minister Mehbooba Mufti said "there are some who throw stones, but not all the youth from Kashmir do so". Kashmiri students were "angry and disillusioned", she told reporters at a brief interaction at the opening of the Civil Secretariat in Srinagar, referring to the ongoing protests. In Pulwama, the anger was visible as school students marched against what they described as police highhandedness, clashing with security forces. Police said the students threw stones at the security personnel. The students were demanding action against security personnel who had allegedly roughed up students during the ongoing protests. Ms Mufti said that some students were being "provoked". "Some are being provoked. I think we should all work together to resolve this situation," she said. Calling the Jammu and Kashmir as the "soul" of India, Ms Mufti said young men and women in the state had been excelling in national-level examinations and in sports. "They have so much potential that they can prove themselves anywhere in the country," she said. Meanwhile, Jammu and Kashmir police on Monday said it does not want any confrontation with the students and was trying to counsel them as they are being instigated. "Our endeavour is to not have a confrontation of the students with the police. That is why you have seen that we have exercised maximum restraint in all such incidents (of student protests)," Inspector General of Police (Kashmir) S J M Gillani told reporters in Srinagar. "We did not take action near any of the colleges, but we will take a legal action wherever law and order is disrupted," he said. "Our attempt is to counsel maximum students and their parents so that their career is not affected," he added. A police raid on government degree college in Pulwama on April 15 had triggered protests by students in various other parts of Kashmir which continue to take place intermittently. Mr Gillani said the student protests were under control to a large extent.